We Got a Whole Stalk of Brussels Sprouts in Our CSA! 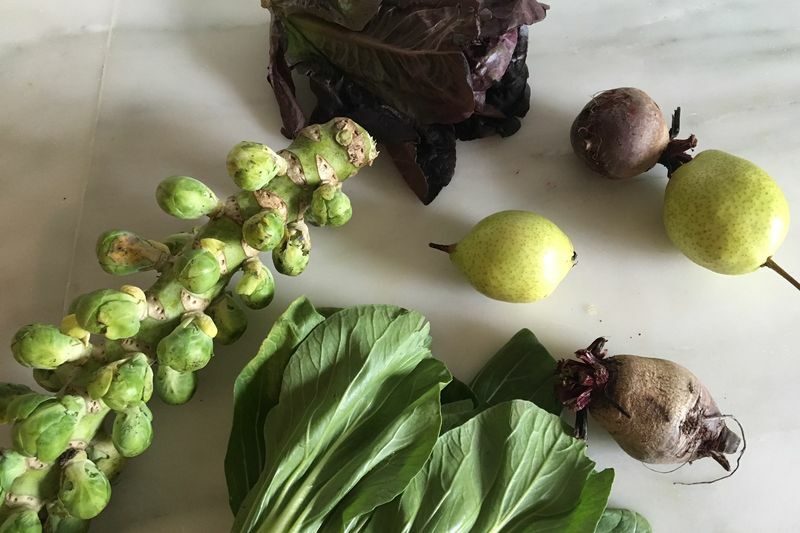 This week's Local Roots CSA share came today, and in it was fall produce (and fruit) with a color palette we can get behind: We got a honking stalk of brussels sprouts, leafy pods of bok choy, a couple handfuls of red leaf lettuce, some golden-yellow pears, and a few dusty violet beets. We could top the lettuce with lemon caper dressing, or roast the pears and beets together for a salad. We could get really wild and take the whole stalk of brussels to an outdoor grill (what's the proper way to remove them from their stalk, anyways?). What should we make with it all? Help us decide! We want to hear what you would make with our CSA share! Share your ideas in the comments. I got the big stalk in my CSA today, too. Knowing that there will be more to come this season, I elected to freeze this particular batch so that I could focus this week's cooking energy on the other less put-up-able items in today's box. I sliced each sprout off with a paring knife, soaked them in cold water for about 20 minutes to get off the grit, separated them into small/medium/large piles, and blanched them according to size for 1/2/3 minutes. After quick-chilling them in a bowl of ice water to stop the cooking, I dried them off thoroughly and put them into freezer zip bags for future roasting adventures. I had big stalks two weeks in a row. I roasted the first batch much as Niknud suggests. For the second batch, practicing for holiday dinners where the oven is earmarked for other dishes, I blanched the sprouts, then sauteed a thinly-sliced shallot, then added salt, smoked paprika and the sprouts and cooked them until they were tender. Delicious! I'm going to finally get around to making a Brussel's sprout gratin this year! Fry the sprouts until crispy then toss in a fish sauce caramel? Fish?! Sauce?! Caramel?! Please share recipe!! Vegetable stock with the stalk? I have no idea what the 'proper' way is to remove sprout from stalk - I always just snap or snip them off. And I still say you can't go wrong with the whole high heat roasting approach. I cut the sprouts in half (or quarter if they're big), toss in some diced uncooked bacon (no need to add oil if you have delicous bacon fat), salt and pepper and roast at ~430 on a baking sheet tossing every ten minutes until done. Finish with some toasty pine nuts and you're good to go. Love the sprouts!